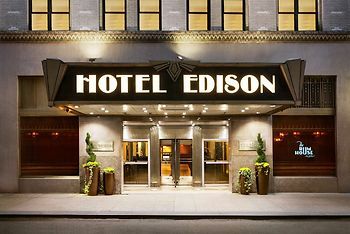 Hotel Edison, New York, United States of America - Lowest Rate Guaranteed! With a stay at Hotel Edison, you'll be centrally located in New York, within a 5-minute walk of Broadway and Richard Rodgers Theatre. This hotel is 0.3 mi (0.5 km) from Times Square and 0.3 mi (0.5 km) from Gershwin Theater. Great location; friendly staff; reasonable price. Room was very hot. Elevator situation was difficult. Understand the construction, but wait times for elevator were still too long. The convenience of getting to the Broadway theaters. I know the hotel may not be able to totally control the heat in the room (18th Floor) but there was too much heat even with the heat off. Our stay would have been improved if the room had a small fridge and a line over the bath to dry small items of clothing. Nice room on 20th floor. Can't beat the location. It has a wonderful location. The concierge was very helpful. The room was comfortable. The coffee shop was great. No electric plugs except one in the bathroom! No space on the sink. No coffee pot.